Cameras Downunder Gallery - Leica Cameras & Leica Copies/Canon IVSB2. camera. photo 1. 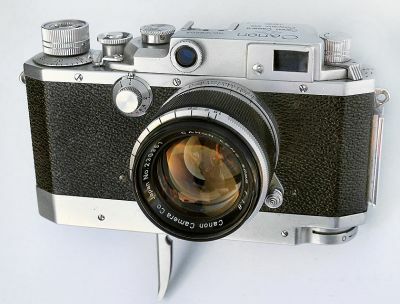 Canon IVSB2. camera. photo 1. Canon IVSB2 with Rapid Winder, 35mm CRF.camera, cloth shutter curtains, identified on Top plate, Rapid film transport leaver in the base. Lens: Canon f-1.8/50mm. made by Canon Camera Inc. Japan. ca.1954, also a red ( E.P )in a diamond shape marking in top plate.